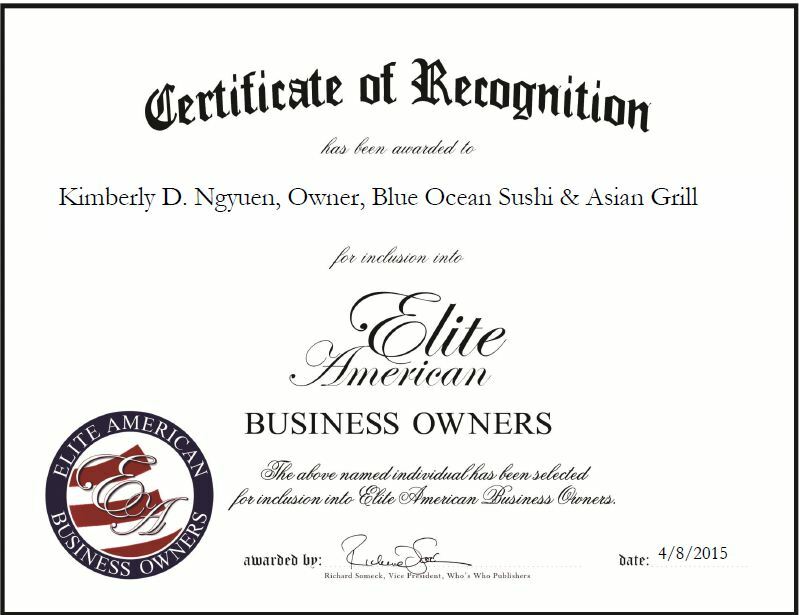 Lewisville, TX, April 8, 2015, Kimberly D. Ngyuen, Owner of Blue Ocean Sushi & Asian Grill, has been recognized by Elite American Business Owners for dedication, achievement and leadership in Asian cuisine. When she first moved to the U.S., Mrs. Ngyuen spoke very little English and began working in various restaurants. She started in one place as a bus girl and was soon promoted, working with top chefs in the area. She had a dream to start her own business and ventured out on her own 13 years ago. Blue Ocean Sushi & Asian Grill is a customer-oriented restaurant that serves traditional authentic Japanese cuisine and various Asian specialties. The restaurant is also the perfect place for patrons to celebrate birthdays, reunions, anniversaries, receptions and even a place to conduct business meetings. Blue Ocean Sushi & Asian Grill serves quality, healthy food and offers top-notch customer service. The restaurant has been recognized for its excellence by being named Best of the Best by Readers Choice, and Best Restaurant in the Area, Dallas /Fort Worth and Best Neighborhood Restaurant by Dallas Magazine. An experienced executive chef, Mrs. Ngyuen excels at creating different dishes that satisfy various palates. She spends her days managing daily business operations, and overseeing the staff, food selection and presentation, as well as customer satisfaction. Mrs. Ngyuen attributes her success to God, learning from past failures, her passion for her business, great customer service and a positive attitude. She enjoys what she does and enjoys providing fine food for her customers. In the coming years, she intends to mentor her son and daughter so that they can continue her legacy. She also hopes to experience the continued growth of the restaurant. This entry was posted in Food Service and tagged Asian cuisine, chef, entrepreneur, Japanese dishes, restaurant, sushi, Texas. Bookmark the permalink.